This 4th of July I will be making my usual ribs, salmon, burgers and hot dogs, but I have so many vegetarian and vegan friends that I will also be grilling up some fun veggie dishes. I love to create and eat wonderful vegetarian dishes, however, it can be quite challenging because it is not just about replacing meat. You have to layer the flavors so that they are rich and complex. Below I’ve included some of my newest recipes, as well as a few old standards. If you are not vegan then cheese is one of life’s perfect foods. Cedar planking the brie is just a way to bring about another flavor. If you don’t know about Halloumi Cheese you are about to meet your new favorite grill mate. This creamy, chewy, mild cheese picks up beautiful grill marks and a touch of smoky flavor. Traditionally prepared from sheep’s milk in the Greek island of Cyprus, Halloumi is a soft curd-like cheese free of rennet and safe for vegetarians who do not eat rennet. Serve it with crusty bread as an appetizer or in salad with quinoa and arugula. I am looking for other things to grill besides tofu as I am trying not to have too much soy. I use almond milk in the polenta and it turned out nicely! Here are some great ways to celebrate our country’s independence — and with these recipes — to create some new traditions as well. Soak the cedar plank in water for at least 30 minutes. If necessary, weigh it down to keep it submerged. Meanwhile, in a small bowl stir together the brown sugar, pecans, dried cherries and bourbon; Heat the grill to indirect medium heat. Place the brie on the wet cedar plank. Place the plank on the grill and cook for 10 minutes, or until the Brie is slightly softened and the sugar melts. Meanwhile, in a medium bowl, toss the apple and pear slices with the lemon juice. 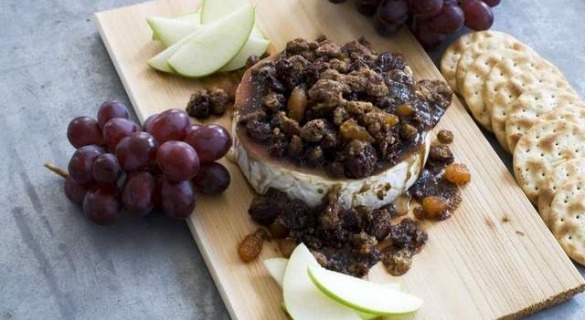 Arrange bread, the slices of apples and pears and grapes around the side of the Brie. Serve on the plank with a cheese knife. To prepare artichokes: Fill a stockpot with water; add the juice of 1 lemon. Trim leaves from the top of an artichoke. Remove the outer layer(s) of leaves from the stem end and snip all remaining spiky tips from the outer leaves. Trim an inch off the bottom of the stem and use a vegetable peeler to remove the fibrous outer layer. As each artichoke is prepared, drop it into the lemon water to prevent it from turning brown. When all the artichokes are prepared, cover the pan and bring to a boil. Boil until the base of the stem can be pierced with a fork, 12 to 15 minutes. Transfer to a cutting board and let stand until cool enough to handle, about 10 minutes. Meanwhile, preheat grill to medium. Slice the artichokes in half lengthwise. Scoop out the choke and first few inner layers in the center until the bottom is revealed. Brush each half with oil and sprinkle with salt and pepper. Grill the artichokes until tender and lightly charred, about 5 minutes per side. Transfer to a serving platter, squeeze half a lemon over them and garnish with the remaining lemon half cut into 4 wedges. Serve warm, at room temperature or chilled. Place a grill pan over medium-high heat or prepare the barbecue (medium-high heat). Brush the vegetables oil to coat lightly. Sprinkle the vegetables with salt and pepper. Working in batches, grill the vegetables until tender and lightly charred all over, about 8 to 10 minutes for the bell peppers; 7 minutes for the yellow squash, zucchini, eggplant, 4 minutes for the asparagus and green onions. Arrange the vegetables on a platter. Meanwhile whisk 2 tablespoons of oil, balsamic vinegar, garlic, parsley, basil, in a small bowl to blend. Add salt and pepper to taste. Drizzle the herb mixture over the vegetables. Sprinkle with goat cheese and serve. Wash vegetables except mushrooms. Brush mushrooms clean. Cut vegetables to size according to recipe. Thread vegetables onto skewers. (If using wood skewers make sure you soak them) Place on grill over medium-hot heat. Grill 20 minutes or until tender, turning frequently. In a medium bowl, whisk together rice wine vinegar, ginger, garlic, red pepper flakes, and a dash of salt and pepper. Add cucumber and scallion and toss to combine. Cover and let stand. Lightly oil a 9-inch square ceramic baking dish. In a medium saucepan, combine the almond milk, garlic, rosemary and thyme and bring to a boil. Remove from the heat, and let steep for 10 minutes. Discard the garlic, rosemary and thyme and return the mixture to a boil. Gradually whisk in the polenta and simmer over low heat, whisking often, until very thick and no longer gritty, 10 minutes. Season with salt and pepper. Pour the polenta into the baking dish. Let cool to room temperature, then cover and refrigerate for at least 2 hours. Meanwhile, in a small saucepan, boil the balsamic vinegar over moderately high heat until reduced to 1/4 cup, about 15 minutes. Let cool to room temperature. Light a grill. Drizzle the radicchio wedges with olive oil and season with salt and pepper. Grill over moderately high heat until lightly charred and just tender, about 3 minutes per side. Clean the grill with a wire brush. Carefully unmold the polenta and cut it into 8 wedges or squares. Brush all over with olive oil. Grill the polenta until it’s lightly charred on the bottom and releases easily, 4 minutes per side. Arrange the grilled polenta and radicchio on plates drizzle with the balsamic reduction and serve. Serves 4.
garlic; cook 1 minute longer. Add panko; cook and stir for 2 minutes or until golden brown. Remove from the heat. Stir in the mozzarella cheese, mint and salt. Spoon into zucchini shells. Sprinkle with Parmesan cheese. Grill, covered, over medium heat for 8-10 minutes or until zucchini is tender. 4 servings. In a small mixing bowl, cream the butter with the honey, limejuice and chili powder. Leftovers may be refrigerated, tightly covered with plastic wrap, for up to 2 weeks. Peel one side of cornhusk away from cob without removing completely and loosen remaining husk. Do not remove silk. Brush butter mixture over kernels and smooth back husk to original shape. Twist open end to close. Prepare grill. Place corn directly onto coals. Cover grill with lid or foil tent. Cook two to three minutes. Test. If not done, turn and roast another two minutes. The outside husk will be charred. To serve, strip off husks and silk. Lightly coat asparagus, zucchini, squash, eggplant, pepper and corn with olive oil. Heat cast iron grill pan over high heat. Grill vegetables until tender. Toss arugula and romaine leaves with jicama and Tomatoes. With buttermilk balsamic dressing e in a bowl. Arrange on platter and top with grilled vegetables. You can top with ground pepper, shaved Parmesan or crumbled goat cheese. Whisk together all ingredients until well mixed. Let stand for one hour. Gwen Kenneally is the owner of Back to the Kitchen, Full Service Catering and Party Planning. She is the co-founder and master baker at Magpie Gourmet Mini Pies. CLICK HERE to Learn from Gwen through her instructional videos featured on EHow. Check out her websites www.Backtothekitchen.net and http://magpieminipie.vpweb.com. Her Sweet and Savory Cookbook is available through AMAZON .